The older I get, the more I value the importance of good health and good physical fitness as it relates to long term survival. After huffing and puffing during a recent hike up 800 feet, I realized that the time had come to reassess my personal health and fitness goals and to bone up on personal medical preparedness. It is not that I am in bad shape, mind you, but that there is room for improvement. What I am talking about here is not only the replacement of toxic pharmaceuticals with natural remedies, but with an overall physical assessment to include mobility and stamina as well as diet, exercise and heart health. Somewhat egging me along is the realization that this is one area of survival prepping that tends to fall to the bottom of almost everyone’s priority list. Think about it. You might have six months of food, six months of water, a sustainable food garden, a fully stocked first aid kit, and tools, supplies and generators that would allow you to live off the grid if the SHTF. But what if you had to flee? What if you had to grab your boots, bags and backpacks and really get the heck out of dodge? Could you make it? How far could you walk in dangerous weather conditions or uncertain terrain? And the stress. Could you cope? 5 Like this and want more? Health: What the state of your general health? Do you take a lot of prescription drugs? Is your weight in proportion to your height? Do you check your blood pressure regularly and do you see a dentist at least once a year for a general checkup and cleaning? Fitness: Do you exercise regularly? How far can you walk briskly without getting winded? Mental Balance: Are you happy? Can you cope with the stresses of daily life? Do you consider yourself mentally “balanced”? Here is the result of my own inventory, taken about a month ago. The scoring is completely arbitrary but you will get the drift. Health: Survival Woman gets an A. Not much in the way of prescription meds required, no health issues, height and weight in proportion. Survival Husband gets a C. Overweight, lots of meds, aches and pains, acid reflux and other yuks. Fitness: Survival Woman gets a B. Walks 3 to 4 miles at least three times a week but does not do any weight training Survival Husband gets a C+. Walks when he can (but usually not more than twice a week) but does some infrequent weight training. Both get extra credit for ballroom dancing 2 to 4 hours a week. Mental balance: Survival Woman gets a C-. Work related stress, lack of personal time, does not sleep well. Survival Husband gets a B. He does not let things bother him, easy going, makes time to do the things he loves. Now it is your turn to take a personal inventory. Ready? So how do we take our scores and bump them up a notch? I have some thoughts but first let me say that it is my belief that these three survival tools (health, fitness and mental balance) work together so that improvement in one area should help the other two. Want some recommendations? 1. If you are overweight or have a curable health condition, what are you waiting for? Now is the time to start that diet, fix that bum knee, and yes, get those teeth taken care of. Stock up on some supplements (a multi vitamin, calcium, magnesium, fish oil) and don’t forget to take them. Even if you don’t have health insurance, shop around for some low cost clinics and make the investment in your health. 2. I believe that the best piece of fitness equipment is what nature gave us, our own two feet. That means that with comfortable clothes, some hiking shoes or sneakers (my favorites are Skechers Shape-Ups for both men and women – love them!) and the will to move, we can get in shape pronto. All that is required is a bit of time, some place to go, and if you are so inclined, an mp3 player with music or an audio book. Evaluate the stresses in your life and work on the one or two items over which you have some control. For example, if the clutter in your home is driving you nuts, take an hour a day for the next week to de-clutter your living space. When that it done, tackle the next item. The idea is to set aside and forget about those items you cannot control – you will only frustrate yourself and set yourself up for failure. My personal stress relief checklist, starting now, includes removing the piles of paper and projects that litter my workspace, not working weekends, eating at least one real meal daily and not just a bowl of cereal, and perhaps most important, taking some time to watch a movie, read a book or do something non-computer oriented for at least an hour every day, not just occasionally. It always surprises me how great a difference even the smallest change can make to one’s well-being. Likewise, tinctures and teas made from herbs (try Ginger tea) along with some honey can be used to heal a variety of maladies from the inside out. Just keep in mind that learning to use herbals and essential oils takes practice so, like growing a garden, you need to learn what works and what doesn’t. Once you do, you will be amazed at the results. Without being overly simplistic, working on these four aspects of health preparedness will go a long way toward seeing us through a disaster, a personal or economic crises or even SHTF. The important thing, in my opinion, is to come up with your own list and to remember to keep it simple. Approach an overall improvement in a one-week-at-a-time manner just like we are doing with prepping. If this is a topic that interests you, take a jump over to the Mayo Clinic web site and read what they have to say about stress and your overall health. A while back, Contributing Author Joe Alton provided me with an “Open Letter to Preppers” regarding the importance of medical preparedness. Let me share it with out. After gathering food and building a shelter, many people in the preparedness community consider personal and home defense to be the next priority in the event of a societal collapse. Certainly, defending oneself is important, but have you thought about defending your health? In a situation where power might be down and normal methods of filtering water and cleaning food don’t exist, your health is as much under attack as the survivors in the latest zombie apocalypse movie. Infectious diseases will be rampant in a situation where it will be a challenge to maintain sanitary conditions. Simple chores, such as chopping wood, commonly lead to cuts that could get infected. These minor issues, so easily treated by modern medical science, can easily become life-threatening if left untreated in a collapse scenario. Don’t you owe it to yourself and your family to devote some time and effort to obtain medical knowledge and supplies? The difficulties involved in a grid-down situation will surely put you at risk for sickness or injury. It’s important to seek education so that you can treat infectious disease and the other ailments that we’ll see. There will likely be a lot more diarrheal disease than gunfights at the OK corral. History teaches us that, in the Civil War, there were a lot more deaths from dysentery than there were from bullets. Some say “Beans, Bullets and Band-Aids”, but I say “Beans and Band-Aids, then Bullets”. I suppose, as a physician, that’s not too surprising. If you make the commitment to learn how to treat medical issues and to store medical supplies, you’re taking a genuine first step towards assuring your family’s survival in dark times. The medical supplies will always be there if the unforeseen happens, and the knowledge you gain will be there for the rest of your life. Many medical supplies have long shelf lives; Their longevity will one of the factors that will give you confidence when moving forward. It’s important to know some illnesses will be difficult to treat if modern medical facilities aren’t available. It will be hard to do much about those clogged coronary arteries; there won’t be many cardiac bypasses performed. However, by eating healthily and getting good nutrition, you will give yourself the best chance to minimize some major medical issues. In a collapse situation, an ounce of prevention is worth, not a pound, but a ton of cure. Start off healthy and you’ll have the best chance to stay healthy. When I say to obtain medical knowledge, I am also encouraging you to learn about natural remedies and alternative therapies that may have some benefit for your particular medical problem. Essential oils, herbal remedies, and other time-honored methods of healing should not be overlooked as you put together your medical supplies. I cannot vouch for the effectiveness of every claim that one thing or another will cure what ails you; suffice it to say, that our family has an extensive medicinal garden and that it might be a good idea for your family to have one, also. Many herbs that have medicinal properties grow like weeds, so a green thumb is not required to grow them. Many of them do not even require full sun to thrive. Even the White House garden has a collection of these beneficial plants. I’m not asking you to do anything that your great-grandparents didn’t do as part of their strategy to succeed in life. In a collapse situation we’ll be thrown back, in a way, to that era. We should learn some lessons from the methods they used to stay healthy. Those homespun skills will give you a head start to being an effective medic for your family. The non-prepper members of my family wonder why I spend all my time trying to prepare people medically for a collapse situation. They tell me that I can’t turn everyone into doctors, so why I should try? Am I trying to turn you all into doctors? No, there’s too much to learn in one lifetime; even as a physician, I often come across things I’m not sure about. That’s what medical books are for, so make sure that you put together a library. You can refer to them when you need to, just as I do. I AM trying to turn you into something, however: I’m trying to make you a better medical asset to your family and/or survival community than you were before. If you can learn how to treat common illnesses and injuries in times of trouble, I will have succeeded in my mission. This is good advice and a reminder to all of us that our work is never done. We must continue to educate ourselves and continue to acquire skills so that we can truly be an asset rather than a burden to our survival community. Health and fitness is a topic I have been thinking about for a couple of months. As we move forward with our week-at-a-time preparedness mission, we would be remiss to overlook the positive aspects good health and both physical and mental fitness during times of stress. And I don’t know about you, but for me the ultimate stress would be a major natural or manmade catastrophe. Surviving the unthinkable is something I hope we will never have to do. But if the worst happens, I want to be in top shape both mentally and physically. This is not rocket science. It is simply a common sense solution to some universal problems we Americans have when it comes to taking care of ourselves. Bargain Bin: Survival is all about learning to fend for yourself. Here are some of the emergency medical reference books and supplies that belong in every household first aid kit. The Survival Medicine Handbook: A Guide for When Help is Not on the Way: This book by Joe and Amy Alton will teach you how to deal with all the likely medical issues you will face in a disaster situation, and shows you strategies to keep your family healthy even in the worse scenarios. You’ll learn skills like performing a physical exam, transporting the injured patient, and even how to suture a wound. This medical reference belongs in every survival library! Adventure Medical Survival Kits: Adventure Medical Kit products are well priced and with an excellent reputation among outdoor types such as fishermen and hunters. This is a good place to start if you are looking for a pre-packaged kit. Emergency Mylar Thermal Blankets (Pack of 10): For less than $8, this pack of 10 is a great deal. Free shipping too. Omron Series Blood Pressure Wrist Unit: We personally would not be without one of these units. Spark Naturals Essential 4-Pack: If you are just getting started with essential oils, or even if you are not, this is the kit you want. Use code BACKDOORSURVIVAL for an extra 10% off at checkout. Follow Backdoor Survival on Facebook, Twitter, Pinterest, and Google+. 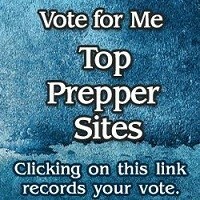 Plus, you can purchase my book, The Prepper’s Guide to Food Storage from Amazon. While maybe not health related – I started experimenting with mylar bags and O2 absorbers. I had a 2 lb bag of long grain rice that I decided to pack in mylar bags. I cut a couple of quart bags in half and sealed one end of the cut off portion. Then I measured one cup of rice into three of the bags, leaving one and one half for the last bag. One oxygen absorber in each bag and sealed. All bags labeled with name, amount, date, and amount of water to cook in. I’m waiting now for the bags to pull down on the rice. I put all the other oxygen absorbers into two pint jars with the canning lid and ring on them. The lids have already ‘snapped’ indicating a vacuum and a seal on them. One cup of rice (after cooking) is supposed to serve four, but in an emergency situation it may not be enough for two! Take up bicycling! It’ll make you young again. I’m 52, and took-up cycling a little over 2 years ago. Thought I was getting old…I was just out-of-shape. Now I’m back in shape- I weigh less than I did in high-school, and my energy has returned; BP is never more than 110/70 (usually lower)….and my willy is bigger now than it’s ever been 😀 Cycling is like the freaking fountain of youth! It’s hard at first, if you’re out-of-shape- but it’s always enjoyable (as opposed to any other form of exercise) and a lot of fun…and it gets easier after a while. Get a nice bike! For most guys over 50 to ride a bike… that is, balancing your entire body over a bicycle seat(which in this case relatively amounts to a golf tee) would seems to create a large amount of “stress” on a man’s undercarriage. Now, speaking for myself, unless my bicycle has a seat similar to a farm tractor… I’m gonna be one sore bicyclist… no matter how much conditioning. Am I missing some bicycling trick that alleviates this centralization of a man’s weight onto such a narrow perch? Your answer is sincerely appreciated, as I’ve been “on the fence” about this physical reality for years. Part of the trick, is to get a good-fitting bicycle. There is an online calculator at competitivecyclist dot com that can really help you out. Another thing, is to get a good quality bike, and one that is made for the type of riding you intend to do (i.e. if you’re going to ride the roads, don’t get a mountain bike…get a road bike). Contrary to intuition, those big fat, heavily padded comfy-looking seats you see at Walmart, will tear you up! The skinny “golf tee” seats actually support you from your sit-bones (instead of the meat on your chooch) and they reduce friction points (and with constant movement and sweat, you don’t want friction!). They may look uncomfortable…but there’s a reason that people who routinely ride 100 miles at a time use them- they work. It varies though. Some people do need to experiment with seats of different sizes and shapes to find one that really works for them. I’ve had good luck though, using the seats that came on my bikes- but then again, I rarely ride further than 25 miles- so it’s not too critical. They also make special shorts for cycling, which have a big chamois pad in the crotch. Not a necessity if you’re not riding too far…but something to keep in mind. Worst case scenario: You may experience some saddle-soreness at first- it is a possibility- but it’s not the end of the world. I got it when I was a kid, a few times (cheap bikes that didn’t fit, with crappy padded seats! )- after a while, you toughen up and it goes away. As moleman said, a proper fitting bike is important, but so is a good seat. It takes me several days (for example, in early spring) to get used to a seat, so be patient. Also–a little known secret–good seats are adjustable. Grab an allen wrench, stick your head under the seat and move things around. Experiment for a few days. Your article fits in with what I have been pondering over. I am 68 with two knee replacements, a bad back and tendency to fall. My knee doctor has me using a cane whenever I am on uneven ground and does not recommend riding a bike as the chances of a bad fall and really injuring the knees is quite prevalent. So it got me to thinking. I am starting a walking regime. Right now I can walk to the end of the block and back. Then I will expand to around the block. Then to a block and half, etc. But this walking is WITHOUT any a backpack, just my everyday carry bag with a few survival essentials. So hunkering in is my best option. I’m working on that — reading, looking at web sites and online webinars, etc. I thought of making a bug out bag. I would only use it if I could drive away (I’m also looking at making my car a “bug out vehicle”) or if someone can pick me up and either take me to their place or to a shelter. With that in mind, my BOB will have need personal items, medications, toiletries, clothing, and a few survival items, such as water purification tablets, a multi-tool, etc. Some of those items (such as the tablets and coffee filters for filtering water) could be used in whatever community I am able to get to. That way I will have what I need and still be able to contribute to the ones who take me in. If this is not feasible I will have to hunker down and pray for the best. So, after saying all that, I have not yet found any survival sites that cater to or have good information for the elderly and/or handicapped and what they should be doing. Do you know of any such sites? Or is that one or more of your planned daily entries? Duh: Wouldn’t you know it? After posting above I saw that you had a search page. I searched for “elderly” and came up with a whole lot of items, including some of yours. Now I have more learning to do. Everyone have a good day and keep your spirits up. @Peggy – I am no spring chicken myself LOL. Keep up the good work; from what you have shared, you are way ahead of the game compared to many. Thinking through your options, whatever they might be, is over half of the battle. Anyone with means can buy stuff but it takes real commitment to have a plan A, B, and C for various scenarios. I totally agree with you on the importance of being physically fit, having a knowledge of your own physical state, your limitations and a knowledge of basic first aid, at the very minimum . I am currently suffering from a knee injury I sustained while helping a friend replace his workshop roof before our Summer rains started. I was stripping the old roofing off and trimming a branch when I stepped to the side and hit a rotted patch. My right leg went through the roof up to my thigh and my left knee buckled and struck solid wood, preventing me from falling all the way through. I went home and took some aspirin for the swelling, I alternated a couple of cycles between ice packs and applying Tiger Balm before going to bed. For anyone who is not familiar with Tiger Balm, it’s great stuff. Rub it on and it heats up to sooth muscles. As my knee hadn’t stopped moving all afternoon I wasn’t that concerned. When I awoke the next morning, I became concerned. My knee was the size of a grapefruit and I couldn’t move it laterally. I did a self exam and there were no bone chips found and no pooled blood, which would have indicated a possible ACL or meniscus tear requiring a MRI and possible surgery to repair. I elevated my leg by placing a pillow under my knee and began applying Tiger Balm again. Between the soothing warmth of the balm and the gentle massaging, my knee loosened up. I applied a neoprene patella support to prevent further injury and got dressed to go work on the roof. Throughout the day, when I would take a break, I’d ice it and take an aspirin every couple of hours. Now, 3 days after the accident, the swelling is about the size of a golf ball and at night I continue to alternate between the ice packs and Tiger Balm. Once my knee is fully recovered, I have promised my girlfriend that I will start going hiking with her! I look forward to that and enjoying the scenery and the company of my bestfriend. While I am not a Doctor and I do not suggest everyone do a self exam or the other things I have done, I do recommend everyone know basic first aid, have a couple of reusable ice packs or those Instant Cold Packs, a muscle rub of your choice, and a pair of neoprene ankle, knee, wrist and elbow braces on hand at all times. In an upcoming blog I will discuss my basic first aid kit and some personal recommendations for yours.